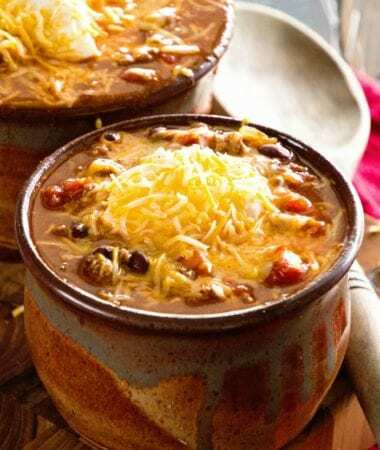 A delicious soup recipe that is comforting and amazing! 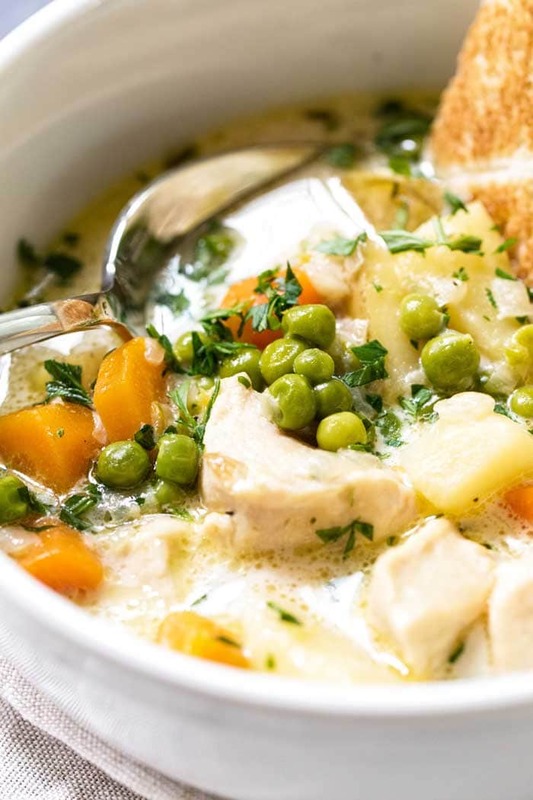 This Homemade Chicken Pot Pie Soup Recipe is a hearty soup recipe full of vegetables and chicken. It’s a retake on the classic pot pie except so much easier to make. It’s a completely homemade soup with good for you ingredients that is bursting with flavor. 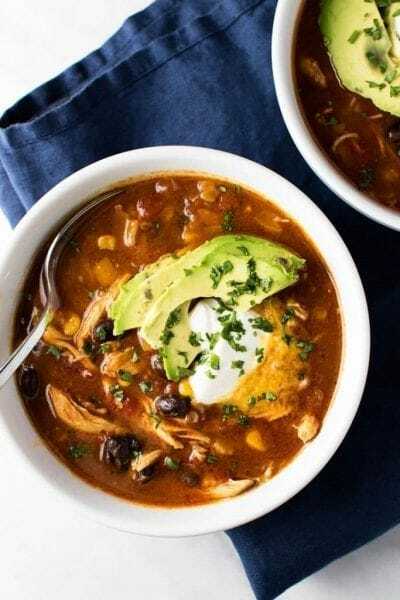 Make this soup for dinner tonight! Some people want an endless summer, but not me. I’m one of those fall-starts-on-September-1st people, who happily dons a fuzzy sweater and sips on soup while it’s still 80 degrees outside because, well, in my opinion, this is the best time of year. I start gearing up about mid-August so when the calendar finally turns it’s full-steam ahead into fall colors, fall clothing, and, of course, fall cooking. 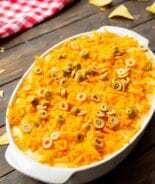 A few of my favorite soups are creamy Chicken Noodle Soup, Cheeseburger Soup, Easy Lasagna Soup, Cheesy Bacon Potato Soup, and Chicken Tortilla Soup. And shouldn’t soup be the official dish of fall? Um, yes. So I’m kick-starting my favorite time of year with this chicken pot pie soup. 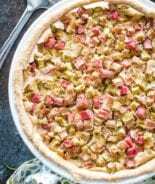 I’m not sure my waistline could handle it if I added it to my go-to dinner repertoire. I mean, I love Ina and I love her pot pie, but I figured there had to be a way to experience those same cozy flavors with a little less butter. So, here we are with chicken pot pie soup. 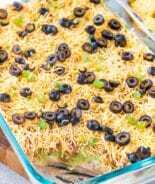 A simpler, quicker, and less calorific version of that old favorite. It’s as good as my other favorites Slow Cooker King Ranch Chicken Soup, Chicken Gnocchi Soup and Crockpot Chicken Noodle Soup, but I was ready for a new soup on the block! 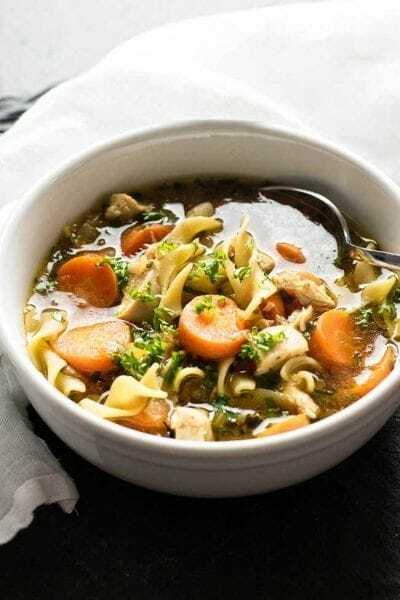 Things I Love About Homemade Chicken Pot Pie Soup Recipe! Comfort Food Need I say More? Less Calories than REAL Chicken Pot Pie! You can see me ticking this off on my fingers as we chat, right? YUM!!! Some might say the best part of pot pie is the crust, but I’ve always been partial to the creamy, savory filling. So instead of a fussy crust, I just toasted up slices of country white bread. 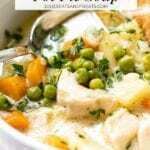 I focused on the part I love – chunks of potatoes, sliced carrots, sweet green peas, and, of course, plenty of tender juicy chicken. 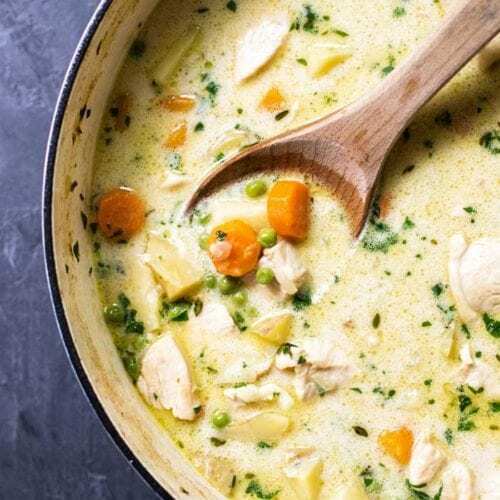 It all cooks together in one pot with chicken stock, herbs, and a little cream added right at the end. Lucky for me my family loves this soup too. 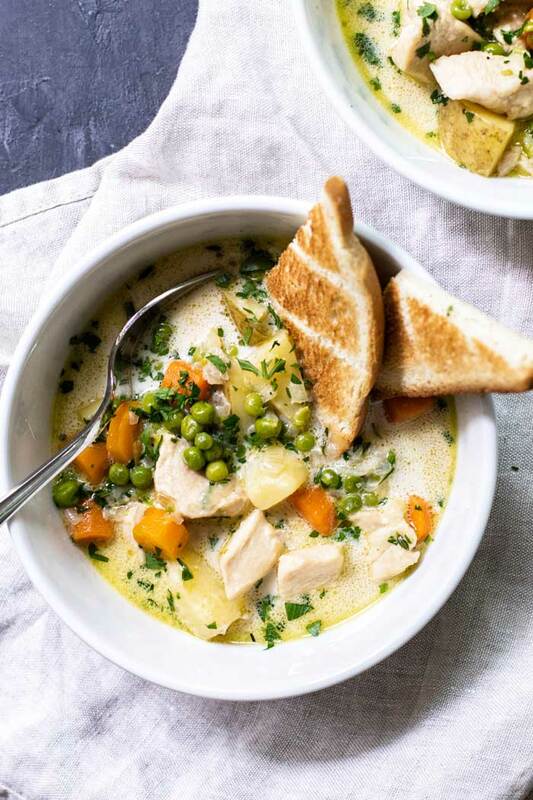 They aren’t big on anything spicy due to the young ages of my children right now, but anything like this Chicken Pot Pie Soup they love! 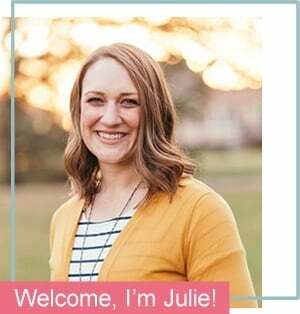 A few of their other favorites are Crock Pot Chicken Noodle Soup and Creamy Chicken Noodle Soup in case you need some more family friendly soup recipes. 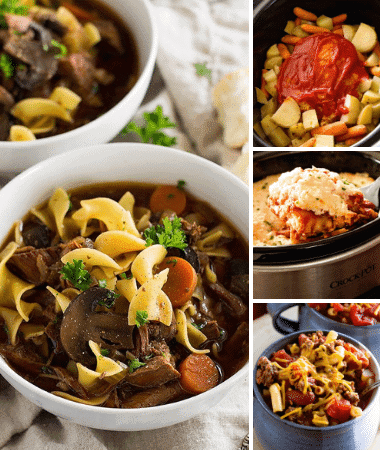 Everything you need right here for the MOST comforting soup! It’s not totally guilt-free, but compare it to the original recipe – it’s almost diet food. Add the chicken and cook it until it’s no longer pink on the outside. Add the onion and cook it until it starts to soften. Add the carrots, potatoes, and garlic and stir it all together. Add the butter to the pan, stirring until it’s melted. Sprinkle with flour and stir. Add the chicken stock, turn the heat to high and bring the soup to a boil. Lower the heat and keep the soup at a constant simmer for twenty minutes. Add the frozen peas, chopped parsley and continue simmering for another ten minutes. Finish by adding the heavy cream and stir to combine. Hungry for more delicious soup? 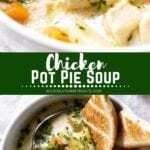 I hope you have enjoyed this Homemade Chicken Pot Pie Soup Recipe as much as I enjoyed bringing it to you! Give it five stars below and share it with your friends! 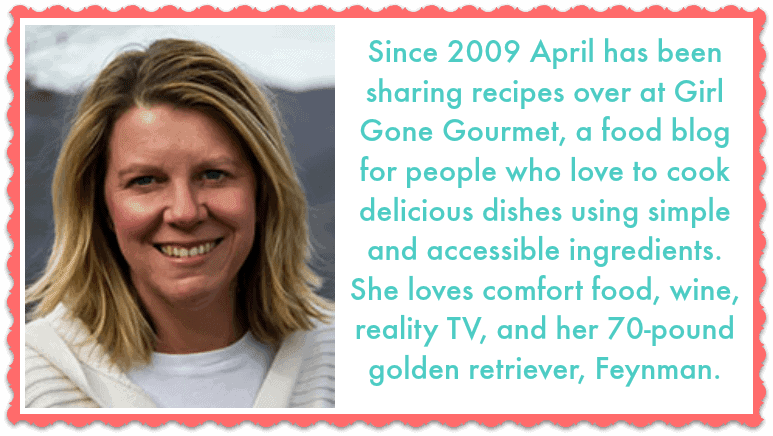 I appreciate your support of blog! 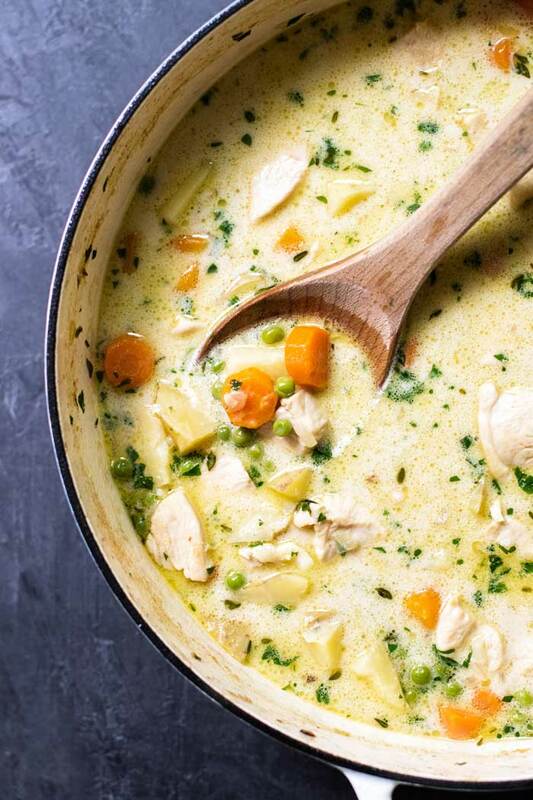 A Hearty Soup Full of Veggies and Chicken. Just like a Classic Pot Pie Except so Much Easier to Make! Heat the olive oil in a large pot over medium heat. Add the cubed chicken and cook it until it’s no longer pink on the outside. Add the onion and cook it with the chicken until it starts to soften. Add the carrots, potatoes, and garlic and stir it all together. Add the butter to the pan, stirring until it’s melted. Sprinkle the flour over the top of the chicken and vegetables and stir. Add the chicken stock, turn the heat to high and bring the soup to a boil. Lower the heat and keep the soup at a constant simmer. Let it simmer for twenty minutes. Add the thyme, frozen peas, chopped parsley and continue simmering for another ten minutes. Add the heavy cream and stir to combine. Ladle the soup into bowls and serve with toasted bread. The ingredients call for fresh thyme but the directions do not say when to add. Is the thyme an optional garnish? It goes in with the peas! Sorry! 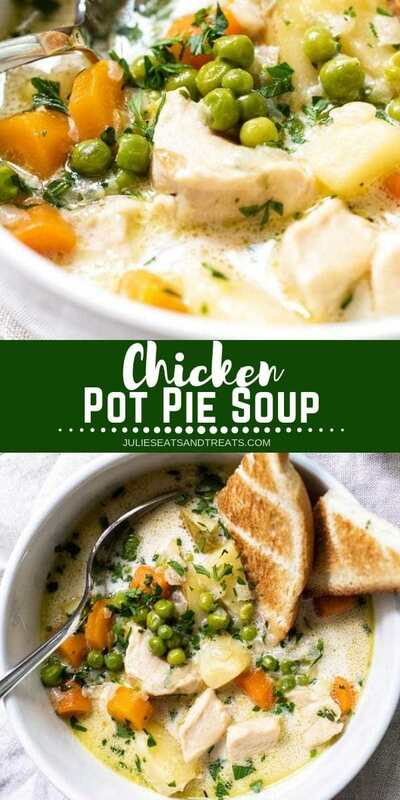 The chicken pot pie soup looks delicious! 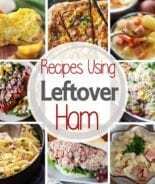 Do you think it could be made in the crockpot? 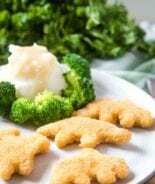 No seasonings, salt pepper or thyme? I would recommend seasoning as you are simmering it to your taste with additional seasonings if you’d like! 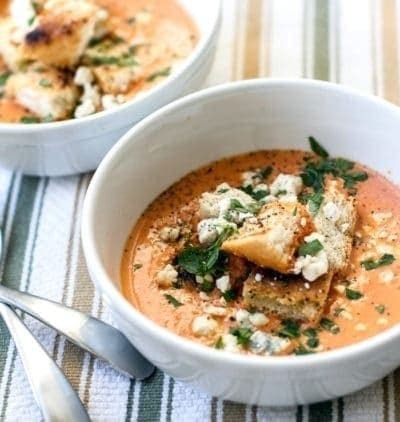 This is a great soup recipe! We love chicken pot pie. One of our faves too! 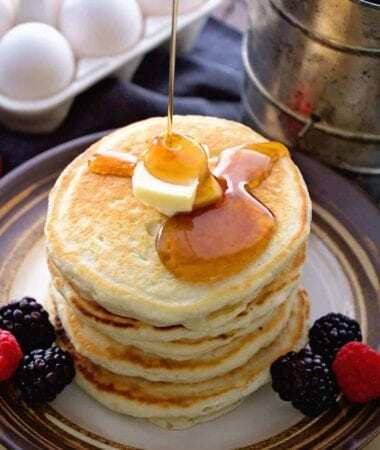 How perfect is this recipe for winter?! I am all about soups right now! YUMMY! Me too! Give me all the comforting soups! Yummmm. Just made this today and it is a definite repeat!